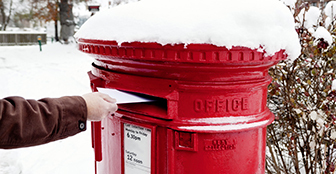 For this year’s Christmas season, Royal Mail has installed a musical letterbox in each of the UK capitals: Belfast, Cardiff, Edinburgh and London. These four letterboxes are fitted with sensors that trigger either the sound of sleigh bells, a Christmas song or a jolly message from Santa Claus every time a letter is dropped. And, of course, they are covered in snowflakes. Merry Christmas!